I've always loved the idea of having a signature scent. I remember my big sister dotting Chanel No5 behind my ears from a tiny sample bottle when I was going on my first date (yeah so I started late, ok?) and telling me it was "the kind of smell men love." I'm sure not many teenage girls would wear No.5 these days with so many 'younger' perfumes aimed directly at them, but at the time I wanted it to be all mine, forever. I soon found out that I get bored of wearing the same fragrance all the time, so while I've never had a signature scent, I've always been a one-bottle-at-a-time kinda girl. Sometimes I don't even make it the whole way through a bottle. Fickle, moi? My current spritz is not a new one... Marc Jacobs Lola. And I have a confession. The first time I smelt this (full of anticipation and totally in lust with the bottle design) I was completely gutted - I hated it. Couldn't get home fast enough to wash it off my wrist. One year on, I adore it. I assume nothing has changed, but my sense of smell clearly has! base: vanilla, tonka bean, creamy musk. I think the first time I smelt this I didn't get past the top notes. The florals in the heart are pretty without being overpowering (I can't stand sickly sweet perfumes) and the warm base notes are very much my kind of smell. This fragrance is warm, fresh and feminine all at once - not an easy combination to achieve in my experience. I can smell it on my skin and it seems to have good lasting power - I'm told that it's one of the few fragrances I've worn which others can smell on me throughout the day. Lola's younger sister fragrance, 'Oh Lola' has just been unveiled and is expected to go on sale internationally in late July. This refreshing scent for hot summer days is described as 'lively, playful, irresistible, stylish and cheerful.' I'm loving the light pink bottle - which will be available in 30, 50 and 100ml eau de toilette - hopefully coming soon to a dressing table near me! 'Oh Lola' has been described as reminiscent of the original Lola, but lighter and fresher. Signed by Ann Gottlieb, it is blended from fresh and sweet fruity tones, along with peony florals and a velvety background of vanilla. Don't know about you but I am LOVING the sound of this and can't wait to try it out! I've never owned a full collection of any fragrance but imagine it must be amazing to layer the scent like this... a girl can dream! I do seem to be a fan of the Marc Jacobs fragrance house in general and can't think of any I've disliked. Even my husband wears the Bang aftershave and I also love the huge bottles of splash on perfume. My previous 'single bottle' was Marc Jacobs Daisy, which is very sweet and pretty - and while I loved it at the time I find its newer sister fragrance, Daisy Eau So Fraiche much more appealing in a 'just want to inhale it' kind of way. Marc Jacobs Essence is a stand out fragrance memory for me - my husband bought it for me as a birthday present early in our relationship, despite it resulting in a beans & toast week! I love the old fashioned style lemon bottle with a little bow - very Audrey Hepburn and reminds me of old black & white movies. 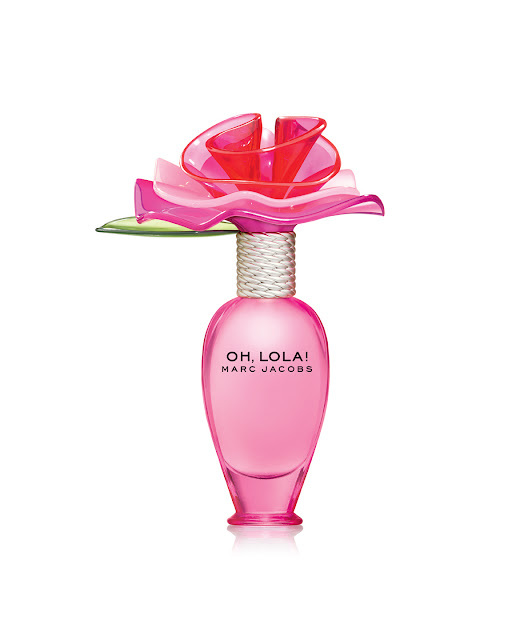 Are you a fan of Marc Jacobs fragrances and do you like the sound of Oh Lola? I have several perfumes on my wish list at the moment, but I'll save those for another day! This sounds gorgeous and the bottle is so cute. Can't wait for it to be released in July. Thanks Strawberry for that interesting blog,I also looooooooove the Lola, I hadn't heard about the new one, and will make a bee line straight for the Oh Lola the next time I'm in town. It sounds lovely! :) Cute blog!! Sounds tempting :) I have never tried it but I think I will look for it in my country now :) thanks for sharing. I love the packaging on these perfumes, they are on my wishlist!